One place we had to make sure to get to before we embarked on our big move from North Carolina to the west coast was Colonial Williamsburg. One of 3 major historical attractions on the east coast Historical Triangle area of Virginia (the other two are Jamestown and Yorktown), Colonial Williamsburg is a re-creation of a 18th century town. It is huge, and includes many wonderful activities, shows, and reenactments. We only had one day there, so I tried to pick a few things to do that would be fun and educational for the kids. 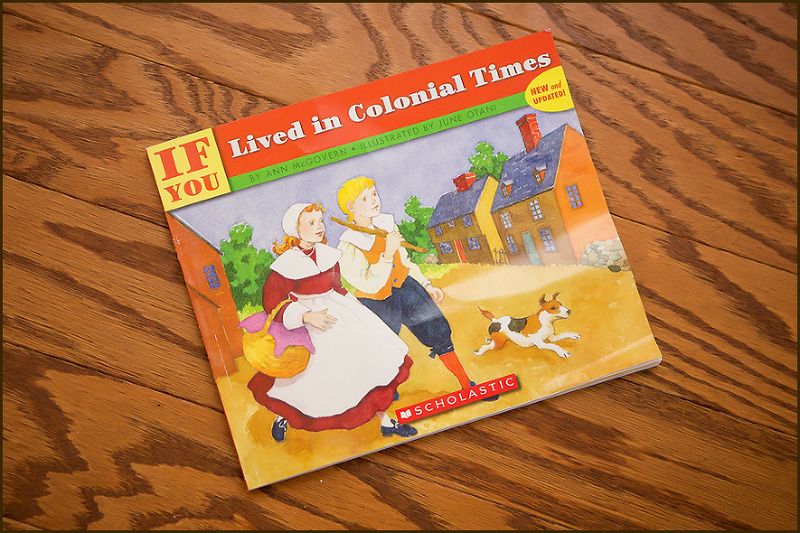 The night before we left, we sat in our hotel and read through the book “If You Lived in Colonial Times” and talked about each section. It’s a great book that covers daily life, medicine, food, and what it was like to be a child in Colonial times. The number one priority for the day was to get there the second they opened at 9am and be among the first to reach the Prentis Store for the big archaeology dig. 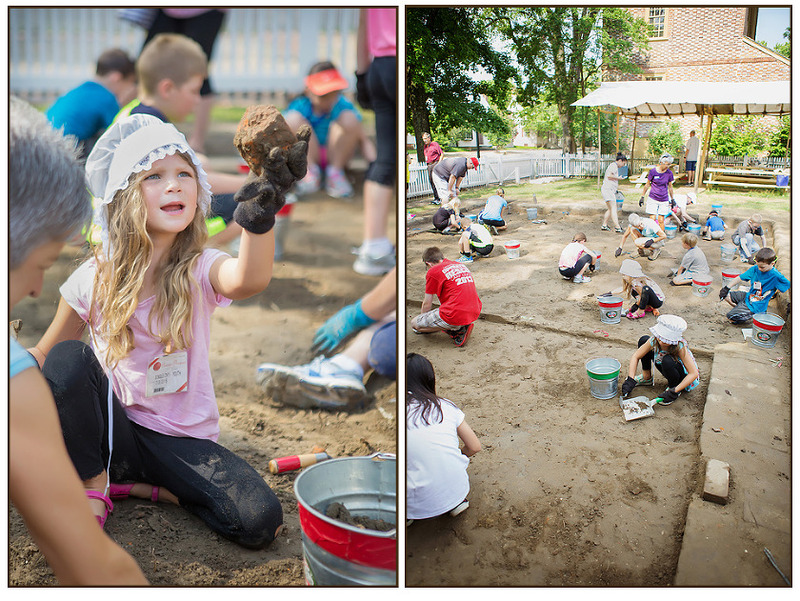 This summer, the staff decided that they would open one of their digs to the public, just a few kids at a time. The site is the Archibald Blair Storehouse, and it is real, not one of those faux digs were items are planted for kids to find. This site has been partially excavated before, so the staff knew there would be a lot to discover. We were lucky to be some of the first to arrive and after a brief speech, the kids were handed gloves, buckets, and trowels and instructed to carefully scrape away the top layers of dirt and fill their buckets. Next came the sifting portion of the dig. all of the buckets were combined and sifted through sieves attached to wheelbarrows. This was the part that really felt like a treasure hunt to the children. Because this location had once been a storehouse, there was quite a variety. Pieces of brick, pottery, nails, glass, and animal bones all emerged out of the piles of dirt. A well formed pig tooth was the biggest hit! The final part of the activity was to bring the finds over to a covered area and investigate and label each item. The staff had laid out diagrams and photos to help identify the animal bones, nails and pottery. A fascinating way to add context to the whole endeavor. The day was beginning to get really hot, so we ducked into a bakery and grabbed some ginger cakes and spiced apple cider to refuel. We passed some actors dressed in pre-Revolutionary War gear and making speeches. When the kids are older and know a little more about US history, we’ll have to come back and spend more time watching the reenactments. Next stop was the military encampment. The stern actor in charge gave us an overview of life for a colonial soldier and lined us up (after promoting Claire to Corporal!!) He then handed out smooth sticks and went through all of the steps involved with loading and firing a musket. Next to the musket training area, another set of soldiers put us through a very detailed demonstration of how to prepare and fire a cannon. Each of the children were given a job and instructed to act out each of the steps, including the many safety measures. Flynn was excited to be the person who holds and delivers the cannon ball, and Skye used a long stick to light the fuse. The demonstration ended with a loud bang and profuse smoke as the cannon was fired. After a tasty lunch at one of the taverns, our last stop was at the Brickmaker. We sat and listened to a description of how the clay bricks were formed and brought to a field to dry in the sun, and then it was time to take our shoes off and help work the clay. 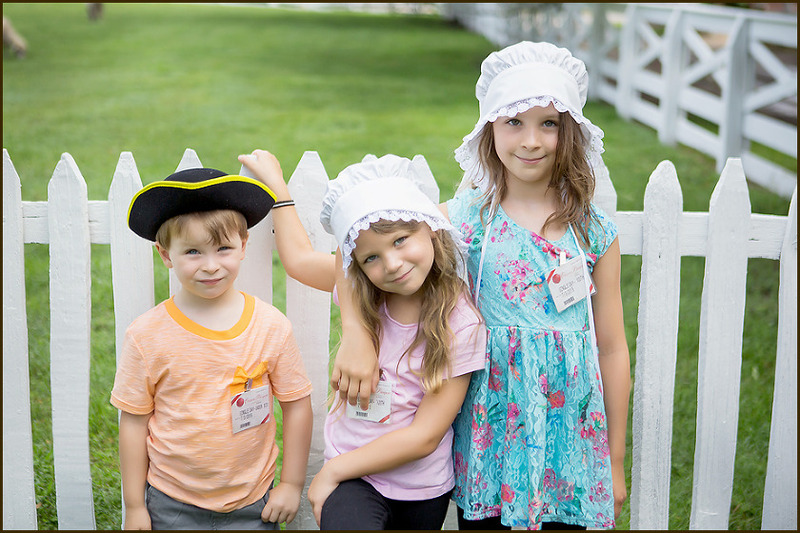 We had a big day, and yet only touched on a small portion of all of the fun that is available at Colonial Williamsburg. I look forward to getting back there in a few years when the kids are older and spending a lot more time exploring.